Microchips are tiny transponders, not much larger than a grain of rice, that are permanently implanted under a pet’s skin. Click here to learn about microchips 101. Microchips contain a unique identification number that identifies your pet when read with a compatible scanner. The veterinarian or shelter worker then calls the microchip’s database registry to retrieve guardian contact information. Of course, for microchips to work as intended, you have to register the microchip and keep your contact information up-to-date. Who has a microchip scanner? All animal shelters and veterinary hospitals have microchip scanners. When an animal is brought to a shelter, he is immediately scanned to check for a microchip and determine if he's someone’s pet. 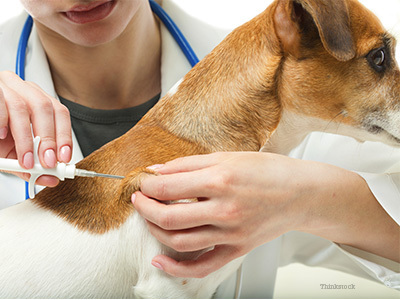 Microchips are placed under your pet’s skin with a needle and syringe, it’s a lot like getting a routine vaccine. Most animals tolerate having a microchip implanted extremely well. No anesthetic is required. There is currently no evidence that microchips cause cancer in dogs or cats. My animal has a collar and ID tag. Does he still need a microchip? While collars and ID tags are essential and can help ensure a speedy reunion if your pet gets lost, they are not a guarantee your pet will be found and brought back home. Collars and ID tags can fall off or break when a cat climbs a tree or a dog plays in a bush. Microchips can never break or fall-off. If my cat is strictly indoors, does he really need a microchip? YES!!! I strongly believe that every animal should wear a collar with ID tags AND have a microchip — this includes indoor-only cats. All it takes is an open door or window for an indoor-only cat to sneak out and then become lost. Why risk losing your beloved pet? Take advantage of this technology and microchip all of your animals. What if I move and my pet has a microchip? If you move or your phone number changes, it’s important to notify the microchip company so that your information remains up to date in the database registry. Remember, a microchip is essentially useless unless your contact information is current and accurate. Is there a fee to register the chip? Some microchip registries charge a one-time database fee; others charge an annual fee and some have no fee at all. BUT remember, this is a small price to pay to help insure your lost pet is returned to you. Where do I get a microchip? Microchips are available at veterinary offices and shelters. Most shelters place a microchip in all of their animals when they get adopted, so if you got your pet from a shelter, chances are he already has a microchip. What if your pet is re-homed? If you re-home your pet, you will need to call the chip registry and notify them of the change. The new guardian will then need to update the contact information. Prevent your pet from becoming one of the many unidentified pets at shelters by ensuring they all wear a collar, an ID tag and have a microchip. No matter how careful you are, you can never be completely sure that your animal won’t escape and get lost. Take every precaution to insure that if your pet gets lost, he has the best chance of coming home to you.